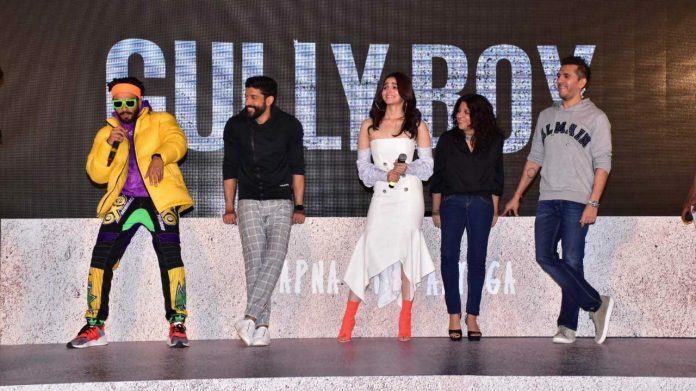 The much-awaited trailer of Gully Boy was launched in a grand event in Mumbai with the present stars Ranveer Singh and Alia Bhatt. The film’s director Zoya Akhtar, producer Ritesh Sidhawani and Farhan Akhtar were also present at the trailer launch. The event started with Ranveer Singh performing rap, along with that, celebrations took place at the trailer launch event where actor Ranveer Singh rapped Happy Birthday song for Farhan followed by cake cutting ceremony. Ranveer Singh and Alia Bhatt were seen making graffiti by putting colour in the poster. The trailer reveals that there is a lot of rappers featured in the movie and as they revealed that, the movie is in the raw ton and inspiring. In the 2 minutes 42 seconds long trailer, Ranveer and Alia rebel against everyone around them to achieve their dreams. The film celebrates the journey of a boy of Mumbai streets as he goes on to become one of India’s most notable rappers. Gully Boy talks about the everyday struggle, grit and determination of the voiceless and the unseen talents. Co-produced by Farhan Akhtar and Ritesh Sidhwani’s Excel Entertainment, Directed by Zoya Akhtar Gully Boy will be released on February 14 in India.